yep that pinkish hue up the side of the males legs is actually a good thing, shows hes nice and healthy and full of 'pep', but thats more environmental rather than slate legs (which is genetic), this reddness/pink hue is quite desirable and in the standard of some breeds (RIR for eg). Hey Guys... Any one out there who wouldn't mind scanning a few pages from Ian Selby's standards? I really don't want to go another season of agonising over birds that I am giving away... wondering if I should keep this one or that for enhancing the lines that I am particularly interested in: Barred Plymouth Rocks, Wyandottes, Light Sussex and Araunconas are what I need to research. Any help would be most appreciated! There are going to be two meetings held to actively discuss the standards, one in the North Island and one in the South Island. They are going to go through breed by breed and discuss if any changes are required, some changes that have already been made ect ect. The meetings are going to be open to ALL poultry enthusiasts, and I encourage those that can make it, and those that are serious about their breeds to go and have some input, as the standard will be unlikely to change again for another 20 years or so. Also you will be able to "sponsor" some of the colored plates (drawings), and this will cost around $100 per plate. You will have your name printed in the book under the plate you have sponsored. Some of the changes I am aware of are pretty major, for example ALL the duck standards are being changed. Some weight specifications for Bantams are being altered. Cuckoo Orpingtons are being added, however Splash, Chocolate and Lavender have been denied. At each meeting the changes will be discussed for each breed, then a decision will be made by majority what changes stay and what goes. That is why it's important we get as many people to attend as we can. As soon as I have the meeting details for each Island, I will post them here. On a side note; Ian Selby has worked very hard to try and maintain a SENSIBLE NZ standard. If we allowed EVERYTHING into the standard, there would be no point in having a standard at all. There are certain things in my own breeds that have been changed, added, or refused that I don't agree with, HOWEVER that doesn't make ME right! If I happen to breed a color that is not in the standard, I just sell them as non-standard birds. Also, Ian has to pay for the printing of the standard before it is printed, minimum order is 1000. He is paying this out of his own pocket, so I think he has the right to say no to anything completely ridiculous! Love me, Love my animals, No exceptions, No compromise! Well said chicibo Also the standards isn't a text book funded by a commercial enterprise or DoC, MAF or the like. The old book has been identified as "incorrect" in many modern areas so can't be sold any more. its great that people want to breed to the standard and it is frustrating not being able to get one. 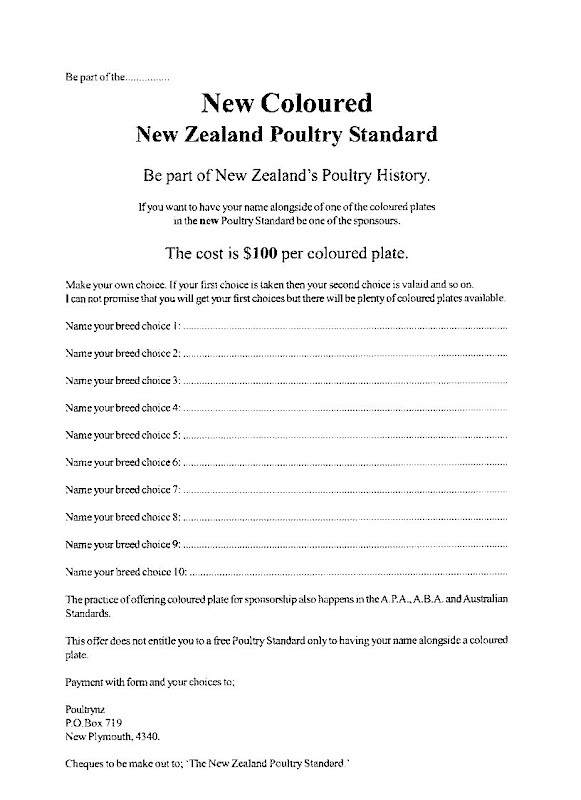 As Chicibo and 99 have pointed out it is not an inexpensive exercise and the more pre order sales that can be made the better, I know the Waikato club has committed to buying a bulk lot from Ian when they are printed, and other clubs may well do so aswell, just to help spread costs around while the new edition gets sold. but the best interim way would be to contact your local breed club, and get acess to the current one through them and even make a committment (deposit??) on one of the new editions then this way no one is short changing anyone else and breaking copyright by scanning and sending via email. 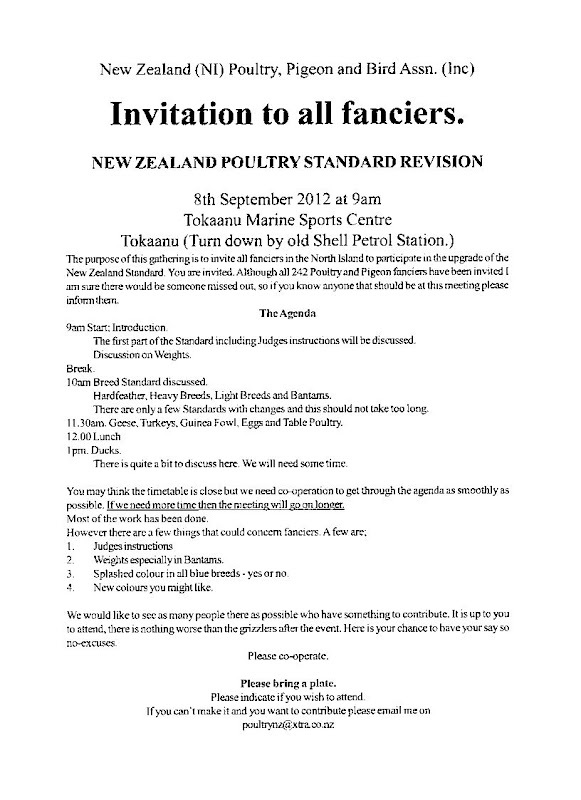 I have scanned and uploaded the letter received from Ian regarding the North Island meeting. so when I've typed one in - can someone double check my text for typos! and not sure I should just add to the end of this thread?? as the individual breed standard will be hard to find - any suggestions about that? should I key in each standard as a new subject? okay, I got a couple typed up - but some of them have a couple of pages explaining the standards/points etc and then another 3 pages on all the colour options available... so sorry, I won't go into each colour!